Whether you’re looking for economical outdoor lighting solutions, corrosion-resistant fixtures for punishing industrial environments or energy-saving LED, Sceptalight fixtures prove themselves to be all-round performers in a variety of indoor and outdoor applications. 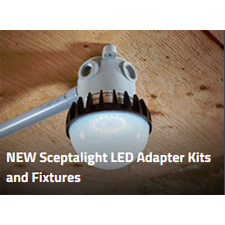 Sceptalight fixtures are made from a glass-reinforced thermoplastic polyester resin, which enable them to stand up better to corrosive elements than metal. This thermoplastic design marries an unrivaled balance of strength, stiffness and toughness with all the benefits users appreciate of Scepter rigid PVC conduit and fittings – long life, easy servicing and high impact-resistance. Sceptalight’s thermoplastic construction offers outstanding corrosion and chemical resistance. Silicone gaskets in Sceptalight fixtures – mounted at the base of the globe and within the ceiling box – provide a water- and vapour-tight seal which protects the electrical connections inside. The Hinged Cover Scepter JBox opens more than 200° for complete and easy access to devices and instruments.NEMA 3R and 4X rated, it ideally suited for indoor and outdoor industrial, MRO and OEM applications and in wash-down environments. 100% non-metallic, it includes all the features that users have come to appreciate in the Scepter JBox. Save time installing a junction box onto utility power poles! Suitable for both indoor and outdoor use, the universal Pole Mount Kit consists of galvanized steel brackets and stainless steel straps and is designed to work with wooden, concrete, steel and fibreglass poles of round, square and octagonal shape up to 15" in diameter. Scepter JBox…the easiest junction box you’ll ever use! We’ve completely redesigned the original junction box making the NEW Scepter JBox the easiest box to use – no matter the situation. The Scepter JBox features an integral gasket, non-metallic fasteners, molded mounting feet, embossed grid-lines and flat cover...all designed to save contractors time and money on the jobsite. The re-engineered SceptaCon Trenchless Raceway joint contains internal features which gradually stop the spigot during insertion to prevent bottoming out within the bell, avoiding the possibility of over insertion. SceptaCon is a proven splinelocking system designed for horizontal direction drilling. Approved for a 65’ bend radius – SceptaCon can bend around obstacles like rocks and other utilities.